In a Steady State project the values in the Trend window will be displayed as a function of number of iterations. Therefore the user may view how variables across the project change as the solution moves towards convergence. In a Dynamic project the values in the Trend window change as a function of time. Therefore the user may view historical data for tags, for example how the level of a tank changes as a function of time. 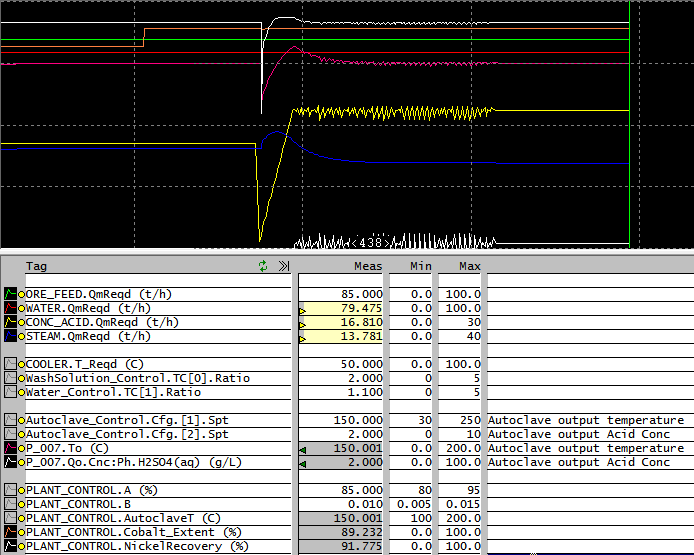 Trend variables from the SysCAD PID controllers using the special Trend Window With Controller option. This is an extension to the normal trend window and is described in Trend Window (with PID Controllers). When a user starts a new project, SysCAD will automatically add a trend window. User may choose to add more trend windows to the project, please see Open a New Trend Window for information. The trend window is saved to a file in the project with a file extension trn. The user can navigate to the Trend windows using the Explorer Window. For a description of menu commands and toolbar buttons for the trend window see Trend Commands. This describes commands for scrolling, zoom in out, various options, etc. The vertical green line represents the most current time (dynamic project) or the most recent value (steady state project). Use to move to the end of time, ie, make sure the most recent value is being displayed on the trend window. Each variable can have a different range, the variable range will fit the full plot area. If the trend line is switched on, it will add the variable to the historian. However, if user manually turns the "Record in Historian" off, the trend lines are not remembered, if you scroll or zoom in the Trend Line View, the trend lines are lost. If the Historian is on, new values will be added to the historian file until it is full, then a new file will be created. SysCAD will only keep a specified number of historian files, the older files will be discarded to make room for new ones. As a result, user may only access the more recent values in the trend. The mouse click options and Trend List View column headings are explained below. 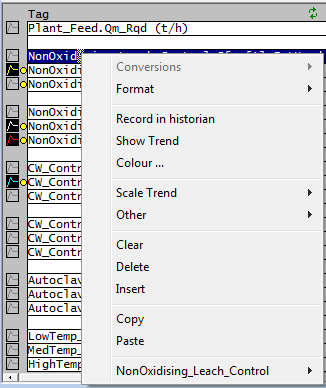 For information about the Trend Window commands, please see section SysCAD Commands - Trend Commands. Ensure that the Trend button is selected. If the user also clicks on the With Controller option then variables from the SysCAD PID controllers will be included. This extension is described in Trend Window (with PID Controllers). This command is only available if a SysCAD project is open. This command is not available if SysCAD is solving or running. In SysCAD 9.3 Build 136 or earlier, user can select this from the File Menu Command as well. The Range specified by the 'Min' and 'Max' values in the Trend Line View. As you move the cursor across the Trend Window, the information displayed in the pop up window changes as a function of time (dynamic project) or number of iterations (steady state project). This allows the user to see the values for Tags for the duration of the project solve time. If the user holds down the Left Hand mouse button the information displayed in the pop up window is for the trend line that is closest to the cursor. As the user moves the cursor across the Trend Line View, the cursor may move between Trend lines and hence display information for different tags. If the user holds down the <shift> key and the Left Hand mouse button the information displayed in the pop up window is for the trend line that is closest to the cursor. As the user moves the cursor across the Trend Line View, the cursor will always remain with the original tag. The first value is the Tag for the Trend line. If the user clicks on this tag the Access Window for this unit will be displayed. The next 3 fields allow the user to adjust the position of the selected trend line in the Trend Line View. If Auto On is selected the trend line is centred on the Trend Line View. Colours allows the user to change the colour of the selected Trend Line or the colour of the Trend Line View background or Grid lines. The user may zoom in on a selected portion of the trend by double clicking on either side of the area of interest. The window will then zoom to the area between the two locations. The duration display on the Trend Window will become the time difference between the two points. The recommended method to add a Tag to the Trend View List is by "Send to Trend" or by using "Copy and Paste". User may also type the tag name and engineering unit into the Tag column. Please note that the engineering conversion unit is case sensitive. Select a variable on the Access Window by right clicking to bring up the pop up menu, select "Send to Trend" to add it to the trend window. When using "Send To Trend", the variable will be added to the most recently accessed trend window, on the first available line under the selected row. Therefore if you want to add the variable to a specific line on a specific trend window, first open the desired Trend Window, highlight the cell where the trend variable should go, then go to the access window and select the variable to send to trend. Alternatively, select a variable on the Access Window by left click, press <Ctrl + T> to copy, switch back to the Trend List View, highlight an empty row and press <Ctrl + V> to paste. Multiple tags can be copied by click and drag on the Access Window. To paste multiple tags, make sure at least an equivalent number of rows are highlighted on the trend window. If the tag is valid, its current value and default ranges will be shown. If the tag entry is not found, a message will appear in the Message Window. Meas: This displays the current value of the tag. The measured value is being constantly updated as changes occur regardless of the historian and trend line status. However, if the entry is in the edit mode, the measured value will not be updated. Hint: If the value can be changed by the user, indicated by a white box field, the user may change the value in the Trend Window. Min: Represents the minimum value on the Trend Line View for that tag. If the value goes below the minimum, the trend line is drawn along the bottom of the Trend Line View. Max: Represents the maximum value on the Trend Line View for that tag. If the value goes above the maximum, the trend line is drawn along the top of the Trend Line View. Description: The tag description is placed here. This field is also used for Driver file tags. Note: When information is copied from the trend window, the descriptions will not be copied. That is, the description is only available on the Trend List View for displaying purposes and is not associated with the model data. Click on the scroll to end button to force the Trend Line Window to request points from the historian and repaint. When the Trend Window is refreshed, the Trend Window requests information from the historian. A small dialog box on the bottom left of the main window will appear and indicate the progress of the requests to the historian. A text description may be entered instead of a tag by placing a ' at the start of the field. A single Left Hand mouse click on the small square box to the left of the tag turns a trend line on or off. A short coloured line indicates the status of the trend line option. To switch off the trend line, simply click on the small square box again. By default, the tag is added to the historian for recording when the trend line is activated - this is indicated by the little yellow dot next to the trend line. 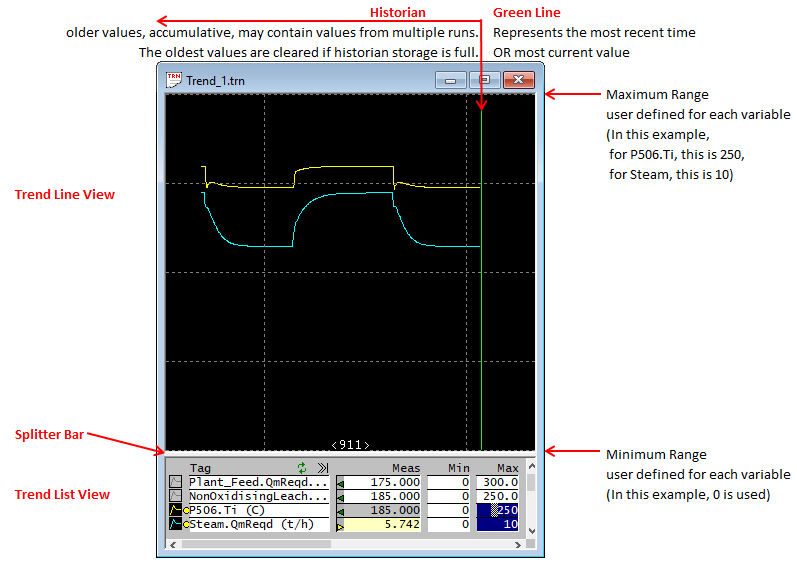 The Trend line may be turned off, but the value may still be recorded in the Historian, as indicated by the yellow dot. A single right click on the small square colour line box to the left of the tag name will display a dialog box that will allow the user to change the colour of the trend line. Conversions - Allows the user to change of engineering units for the currently selected valid tag on the Trend. Format: - Allows the user to change the measured value display format for the currently selected valid tag on the Trend. Record in Historian: - This switches the historian on or off for the current tag. Only available if there is a valid tag on the current line. Show Trend: - This switches the trend line on or off for the current tag. Only available if there is a valid tag on the current line. Colour: - This allows you to change the colour of the trend line for the currently selected valid tag. Fit - Fits the trend between its min and max values on the trend line view. Scale - Changes the scale of the trend based on percentages. Position - Moves the trend scales up and down. Auto On / Auto Off options - These options will toggle the auto scaling on/off. Scroll to End - This causes the Trend Line View to scroll to the end. Select Tag - Allows you to enter a tag into the trend page via the select tag dialog box. This option is very slow and is not recommended. Reconnect Tag - Forces search on the entered tag information for matching SysCAD data. If a match is found, values will be displayed. Options - Opens the Trend Options Dialog Box. Query - Opens the Query Dialog Box. Global Time Base - See Global. Fit All trends - Fits all trend lines to the trend line view. Clear: This allows you to clear the currently selected line(s). Delete: This allows you to remove the currently selected line(s). Only available when SysCAD is not solving. Insert: This allows you to insert blank line(s) at the currently selected line(s). Only available when SysCAD is not solving. Copy: This copies the selected tags or values. Same as <Ctrl+C>. See Copy and Paste. Paste: This pastes the copied information. Same as <Ctrl+V>. See Copy and Paste. Controlled or Referenced Tags: If the tag is controlled or referenced by a control unit, then the control unit tag will be displayed in the menu and the user may navigate to the unit. See Controlled and Referenced Variables. Access... - If current tag is valid, it allows you to switch to the Access Window of that particular unit. Find... - If current tag is valid, it allows you to find the graphics of the unit on the Graphics Window. If the right mouse click is anywhere on the column-heading row, the following pop up menu is displayed. All the options available here are global options. All options above are explained earlier with the exception of Trend Indicator. The Trend Indicator function will allow the user to locate a trended variable easily on the Trend Line View. To do so, the user selects the Trend Indicator option, then rest the mouse cursor on a selected trended tag on the Trend List View, the trend line in the Trend Line View will blink to indicate its location. The user may first need to fit all the trends to ensure they are all visible. In SysCAD 9.3, some options such as the Trend Indicator are permanent options, they are no longer selectable. A number of dialog boxes related to trends can be shown. This dialog box has been removed, the display options can be set in Tools - General Options - Trends. The display options for each trend page can be set here. Trend Window: Use this to select Trend Window options. Prev and Next Buttons: These can be used to move up and down the list of Trend Windows. Only available if there are more than one Trend Windows in the project. Show Labels Group: These labels can be switched on and off independently. When switched on, they will be displayed on the Trend Window. The start time, end time and duration are shown at the top left, top right and bottom of a Trend Line View respectively. The text is placed on top of the trend lines resulting in some trend information being hidden. The hundred's of a second option indicates whether time labels must show the full time resolution. Grid lines - X divisions: This allows you to divide the x-axis of the Trend Line View into a number of sections. 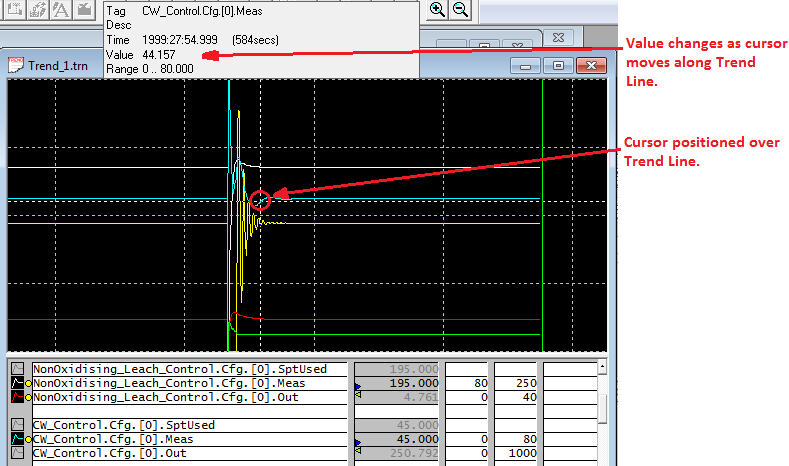 With the correct configuration, one can make estimates of the time span for disturbances shown on the Trend Line View. Note: section widths will always be rounded to the nearest logical time unit. That is, you may ask for five divisions but only three will be shown because of the current duration. Grid lines - Y divisions: This divides the y-axis of the Trend Line View into the required number of sections. Redraw option: Indicates the method that SysCAD must use to repaint the trend lines view when it needs to be scrolled (time line goes to the end). The Scroll option is usually faster. Apply button: This applies the changes made to the selected Trend Window. Apply to All button: This applies the changes to all the Trend Windows. Query button: This brings up the Query Dialog Box based on the currently selected Trend Window. This dialog box is available from a button on the Trend Options Dialog Box and the Trend | Query menu option. This allows you to enter a request to the historian. The results are stored in the specified file. By default a list of all the trended tags (where the trend lines are switched on) for the current Trend Window is shown. The default list would generate a file representing the current Trend Line View. Only tags that are recorded by the historian will be reported by the query. Tags may be added and removed at will. A conversion unit may follow each tag. Note that the query will only accept tags that are currently being recorded by the historian. A number of options may be chosen to configure the report layout. The resulting report is in a comma-delimited file and may be imported into a spreadsheet package to draw graphs. Add Feed Rates to the Trend page to allow easy change without having to right click on all the separate feeders or controllers. Add key process variables to the trend page to observe the change as input variables change. This is an example trend window for the Tutorial project. As demonstrated, the trend window can become the project summary table displaying input and results. This page was last edited on 29 May 2018, at 00:30.